Scott Stitt is a former commercial hard-hat diver with hundreds of hours of mixed gas and saturation dives logged in the offshore oil and gas industry. He’s worked with Texas A&M University and the Institute of Nautical Archaeology (INA) as an underwater field archaeologist. Scott holds a B.Sc. 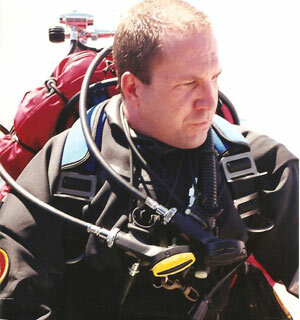 in environmental science and is a 25-year veteran of the Toronto Fire Department, a trimix Instructor and cave diver, who’s worked as an underwater videographer and technical dive supervisor for the Undersea Explorers television show. Scott continues to work as a diving photojournalist, and in his most recent article in Diver Magazine corrected the history of Grenada’s shipwreck the Bianca-C.
Hamilton and Scourge were a pair of armed U.S. Navy schooners from the war of 1812. Both foundered and sank in a sudden squall on August 8, 1913. 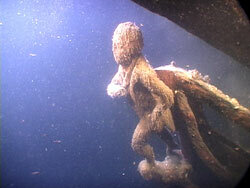 Located in 1973 during a search initiated by Dr. Dan Nelson an associate archaeologist with the Royal Ontario Museum, today they rest in three hundred feet of cold, dark, murky water in the western end of Lake Ontario. 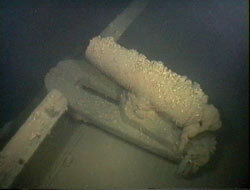 In 1980 the City of Hamilton sought and was subsequently granted title to both wrecks. 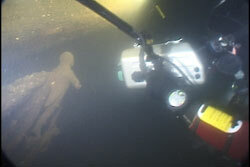 The City of Hamilton and the Ontario Ministry of Culture, Tourism, and Recreation’s archaeology office zealously protected the wrecks. Keeping their exact location secret and misleading the diving public into believing that diving Hamilton and Scourge was a crime, they threatened that anyone caught diving the wrecks would have their equipment confiscated, be fined and even imprisoned. There was no such law, and they had no such authority. Discovering this deception in 1999, Scott Stitt would assemble a small, intrepid and highly skilled team willing to take on the challenge of diving Hamilton and Scourge. Together, the team would relocate both wrecks, and clandestinely conduct a total of ten dives over the course of the next three years without being discovered. This is their story.